Salicylic acid. Camphor. For the effective treatment of verrucas and warts. 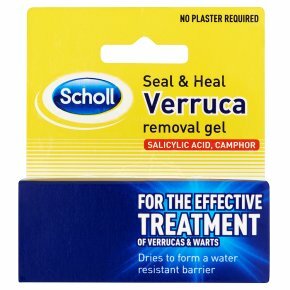 Dries to form a water resistant barrier.Scholl Seal and Heal Verruca removal gel is for the treatment of corns, callouses, common warts and verrucas. Active Ingredients: Salicylic Acid 11.25% w/v, Camphor 2.8% w/v., Other Ingredients: Acetone, Methoxyisopropanol, Pyroxylin, Virgin Castor Oil. Directions: Please read enclosed leaflet before use. Ensure the affected area is clean and dry. Apply twice daily onto the verrucas, warts, corns or calluses and allow to dry. Repeat treatment daily until the verruca, wart, corn or callus can be removed. Scholl Seal and Heal Verruca removal gel can be used by adults and children over 12 years. See leaflet for further information.